FILE - UNICEF staff measure a girl's height to see if she is stunted in a vellage health clinic of South Hamgyong province, North Korea, June 15, 2012. The United Nations granted sanctions exemption to five humanitarian organizations earlier this month, raising the total number of groups that can deliver aid to North Korea to 21. Humanitarian agencies said sanctions placed on North Korea have created complications for aid groups that need to secure funds and deliver assistance to the country. Daniel Jasper, public education and advocacy coordinator for Asia at the American Friends Service Committee (AFSC), said the State Department held a roundtable session with U.S. and international nongovernmental organizations (NGOs) in January to discuss sanctions regulations and travel restrictions. “In the absence of a comprehensive agreement between the U.S. and North Korea, we are hoping the U.S. will tweak existing regulations to help improve conditions for humanitarian operation,” Jasper told VOA. In the meantime, Christian Friends of Korea, a U.S. aid group approved with an exemption this month, left for North Korea on Saturday for a three-week humanitarian mission, according to Heidi Linton, the organization’s executive director who spoke with VOA's Korean Service last week before the group departed. The North Carolina-based group works with “TB, hepatitis and pediatric care centers … and engages on projects such as solar-gravity water system installations, renovations of care centers, and hepatitis treatment clinics," according to its website. The U.S. refused to lift sanctions on North Korea in February when the country’s leader, Kim Jong Un, asked President Donald Trump to remove them during talks at the Hanoi summit. The U.N. and U.S. have placed rounds of sanctions on North Korea since 2016, following its nuclear and ballistic missile tests. Trump said on Friday in a tweet that he is against imposing “additional large-scale sanctions” on North Korea. According to Peron, sanctions make donors more cautious about funding operational costs. He said suppliers of humanitarian goods take a “risk-averse approach” because of the complicated regulatory requirements, delays in port clearance, higher expenses and “reputational risks” associated with delivering humanitarian aid to North Korea. North Korea is “one of the lowest-funded [countries] in the world,” according to 2019 DPR Korea Needs and Priorities Plan, a report issued earlier this month by the United Nations. With an estimated 11 million men, women and children lacking sufficient nutritious food, clean drinking water, or access to basic health and sanitation services, Peron said in 2018 North Korea received less than half of the $111 million that international humanitarian agencies deemed necessary. This year, the U.N. is appealing for $120 million to cover aid for the most vulnerable 3.8 million North Koreans. 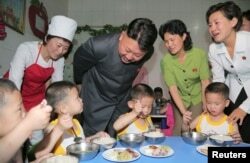 FILE - North Korean leader Kim Jong Un smiles as children eat during his visit to the Pyongyang Orphanage on International Children's Day in this undated photo, June 2, 2014. The UNFPA is one of five humanitarian organizations granted an exemption by the U.N. in March. It focuses on providing reproductive health services to pregnant women through an office it has had in North Korea since 1985. UNICEF, which has been working in the country since 1985, was granted a sanctions exemption by the U.N. in November and has staff in Pyongyang. Peace Action and a number of NGOs sent a letter to Trump in October, asking him to urge the State Department and Treasury Department to modify the U.S. sanctions regulations “to allow timely delivery of humanitarian aid and other NGO engagement” in North Korea, according to the letter obtained by VOA Korean Service. AFSC, which was among the signatories to the letter sent to Trump, has helped North Koreans increase agricultural yields with assistance on implementing sustainable agricultural practices on the cooperative farms. Ahn So-young of VOA’s Korean Service contributed to this report.